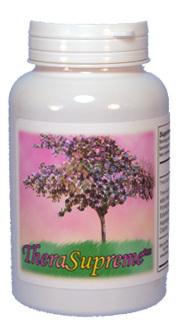 TheraSupreme is a great whole food supplement that is rich in vitamins, minerals, and antioxidants. It is anti-inflammatory and is especially useful for people that react to nightshades. The goal of TheraSupreme was to create a product that is a superb anti-oxidant, high in vitamins and minerals, an immune booster, and a100% natural food product that could be added to a drink as an all round health booster. This product has been a long time in the making, taking over a year to research and develop. There are many products already on the market that have mixes of fruits, vegetables, enzymes, etc. Most of these products appear to put everything that has ever gotten good press into one mix. Unfortunately, in clinical practice these seem to rarely work well with patients, often causing as many health issues as they “claim” to help. With this in mind, we weren’t sure we would be able to make a product to meet our criteria. We started by buying small amounts of most of the individual ingredients found in other products and doing blind evaluation on 50 patients, checking each sample individually for efficacy. We wanted to include only those ingredients that helped close to 100% of patients. Using these criteria in our testing, we found whole categories of items that did not work with the vast majority of patients. These categories included the algaes (spirulina, chlorella, etc. ), grass juices (wheatgrass, barleygrass, etc. ), fungal derived enzymes, and pro-biotics. All of these have their place but again we wanted something that would benefit close to 100% of patients. Unfortunately, most of the above mentioned ingredients appear in most fruit/vegetable blends on the market. We also found the majority of patients did not benefit on alfalfa which is often found in these types products. After much experimentation we settled on 7 ingredients (from an initial batch of 60) and then blended them in varying ratios to obtain optimum results. This is an interesting product because, as with each other Supreme Nutrition Products, every new batch must pass the same testing to be released on the market (this has not always been easy, especially with Morinda Supreme, as many samples had to be rejected). With 7 ingredients in TheraSupreme – we may find it necessary at times to make slight variations in the ingredient list due to possible unavailability of raw materials that pass our testing. The first batch was given to 10 people who took it over a period of time so we could test it for tolerance, taste and effect. It passed our tests but by then some of the ingredients were no longer available so we had to wait for new harvests and evaluate. It is a fun but at times frustrating and lengthy process. We finally have a complete product that passed all our tests that is now available to you. TheraSupreme has the following 7 ingredients: bilberry, blueberry, elderberry, pomegranate, asparagus, black radish, and cilantro (coriander). All have been tested to be free of pesticide residue (We actually like this better than most organic classifications as some organic food is grown on land with a long history of pesticide use and has had only a few years without pesticides). It comes in a 270 gm container with a 9 gm scoop, giving you 30 servings. 3) An all encompassing fruit/vegetable blend containing plants with many different nutrients, colors, phytochemicals, etc. We feel for the sensitive patient this can act like taking a multi-vitamin and for everyone it can supply many phyto-nutrients that we do not get in our daily diet. It will also help boost our nutrient levels and over all immunity, health, and wellbeing. Many patients who suffer from nightshade (solanine) sensitivity report having symptomatic relief while taking Thera Supreme. Bilberry- high in anthocyanin pigments, high in antioxidants, helps prevent atherosclerosis, reportedly helpful for night vision, macular degeneration and some heart conditions and other vascular disorders (1, 2, 3, 4, 5). Blueberry- recent studies suggest blueberries may be useful in reducing cancer risk, slowing the cognitive decline in Alzheimer, controlling blood pressure and prevention of urinary tract infections (6, 7, 8, 9). It can also be a good source of vitamin K as well as manganese (10). Elderberry- another rich source of anti-oxidants and various phytonutrients – it has been shown to have anti-viral activity especially against certain strains of influenza (11, 12, 13). A good source of carotenoids and other nutrients. Pomegranate- potent anti-oxidant with significant amounts of vitamins A, C, E, and folic acid (14, 15, 16). It also helps thin the blood and lower cholesterol (17). Asparagus-supplies vitamins A,C,E, iodine, folic acid (18, 19, 20, 21). Traditionally it has been used to strengthen the genito-urinary system and more recently has been used to help in people with various forms of cancer (22, 23). Black radish-one of the greatest detoxifiers and an activator of liver detoxification enzymes (24, 25). Coriander/Cilantro -contains an antioxidant that helps prevent animal fats from turning rancid (26). It is also mildly anti-bacterial and anti-fungal and used by some to chelate mercury and other heavy metals (27, 28, 29, 30). Written by Dr. Michael Polsinelli, DC on July 4th, 2017 . Jordan and I will be gone on vacation between June 29th and July 4th. On the week of June 25th, we will be working Monday, Tuesday and Wednesday (June 25, 26, and 27). We will be back to work on July 5th (Wednesday) and will be available for appointments on Wednesday, Thursday and Friday (July 5, 6, and 7). We are going for a family reunion for Jordan’s family as well as a trip to Boston to see our amazing daughter. Written by Dr. Michael Polsinelli, DC on June 23rd, 2017 . This is the only supplement that I recommend people stay on once they start. There is a genetic problem that keeps them converting folic acid to its final form. I write about it here. 5-MTHF can help with depression and anxiety. It helps with inflammation and chronic pain. It is necessary for cell repair. It also is needed for several detoxification pathways. For the month of May, 5-MTHF is 20% off. Written by Dr. Michael Polsinelli, DC on April 28th, 2017 . Most of us are low in iodine in Northeast Ohio. For December, all iodine and seaweed supplements are 20% off. Iodine helps support our metabolism (and weight loss), it helps with cold hands and feet, low body temperature (under 98.6), hair loss (especially women, didn’t work too well for me). Other symptoms of an iodine deficiency are tenderness on the ribs right next to the sternum, and being emotional (tear up after seeing a commercial that tugs at the heart), and dreading winter. David Brownstein, MD, states in his book (Iodine : Why You Need It, Why You Can’t Live Without It) that iodine deficiency plays a large role in the production of breast and other cancers. Written by Dr. Michael Polsinelli, DC on December 1st, 2016 . Jordan and I will be visiting her mother. We will be back Monday November 28. Have a happy and safe Thanksgiving. Written by Dr. Michael Polsinelli, DC on November 18th, 2016 . All Probiotics 20% Off for November! Continue Reading All Probiotics 20% Off for November! I know you’ve been waiting for this one. This is the only supplement that I have some patients on permanently. A huge segment of our population (15-25%) have a genetic defect that prevents them from adequately converting folic acid to its final usable form. Folate is needed for proper development, reducing inflammation and pain, several detoxification pathways, for reducing allergic reaction, reducing depression and anxiety. This is a huge deal and it is the only supplement that I will put on sale twice a year. Written by Dr. Michael Polsinelli, DC on September 30th, 2016 . I will be back on Monday morning. Written by Dr. Michael Polsinelli, DC on July 14th, 2016 July 14th, 2016 . 5-MTHF is 20% for the month of May. This is the only supplement that I have some patients on permanently. A huge segment of our population (15-25%) have a genetic defect that prevents them from adequately converting folic acid to its final usable form. Folate is needed for proper development, reducing inflammation and pain, several detoxification pathways, for reducing allergic reaction, reducing depression and anxiety. This is a huge deal and it is the only supplement that I will put on sale twice a year. Written by Dr. Michael Polsinelli, DC on April 30th, 2016 . I will be in Atlanta for the QSM3 conference on Friday, April 15th. I’ll be learning and teaching for this seminar. I’ll be back next Monday. Kathi and Jordan will be here without me. I’m looking forward to implementing some improvements on the adjustment that have been in development over the last couple of months. Written by Dr. Michael Polsinelli, DC on April 14th, 2016 April 14th, 2016 .